Luton Town made it three straight wins in all competitions as a goal in each half secured victory against Barnet. Josh McQuoid sent an early free header at keeper Jamie Stephens but soon after fed Danny Green, who lashed the ball home from the edge of the box. John Akinde missed a good chance to level for the Bees after the break, failing to convert Andy Yiadom's cross. The Hatters took full advantage as Cameron McGeehan swept home the second after Jonathan Smith's shot was saved. Luton climbed to 10th in the League Two table, with Barnet 18th. "I thought the pace of our game was really good first half, we were 1-0 up and it should have been more. "I thought we had some good performers, but overall it was a good team performance. "We'd like to bring someone else in, of a similar ilk to Paul Benson, which I think would be a big plus for us as it brings so many other people into our game and I thought we were first class." "We didn't play as well as we have been playing today. We've been playing very, very well and today I'd say we were just a little bit underneath the level where we have been. "Plenty of crosses went into the box, but we didn't get on the end of any of those, we were second to far too many. Our set play delivery was good today, but the Luton centre-halves dominated everything aerially. "We've had a really good run of form and these players have done fantastically, there's no doubt about that. Today we were just a little bit below the standards we've set." Match ends, Luton Town 2, Barnet 0. Second Half ends, Luton Town 2, Barnet 0. Corner, Barnet. Conceded by Mark O'Brien. Sam Muggleton (Barnet) wins a free kick on the right wing. Substitution, Luton Town. Paddy McCourt replaces Josh McQuoid. Curtis Weston (Barnet) wins a free kick on the left wing. Corner, Luton Town. Conceded by Sam Muggleton. Substitution, Luton Town. Mark O'Brien replaces Danny Green. Attempt missed. Luke Wilkinson (Luton Town) header from the centre of the box misses to the left. Jack Marriott (Luton Town) wins a free kick in the defensive half. Attempt missed. Jonathan Smith (Luton Town) right footed shot from the left side of the box is close, but misses to the right. Danny Green (Luton Town) is shown the yellow card for a bad foul. Elliot Johnson (Barnet) wins a free kick in the attacking half. Corner, Barnet. Conceded by Scott Cuthbert. Attempt blocked. Jonathan Smith (Luton Town) right footed shot from outside the box is blocked. Attempt missed. Cameron McGeehan (Luton Town) right footed shot from outside the box is close, but misses the top right corner. Corner, Luton Town. Conceded by Jamie Stephens. Attempt saved. Jonathan Smith (Luton Town) left footed shot from the left side of the box is saved in the top right corner. Corner, Barnet. Conceded by Luke Wilkinson. Substitution, Barnet. Aaron McLean replaces John Akinde. Substitution, Barnet. Sam Muggleton replaces Tom Champion. Goal! Luton Town 2, Barnet 0. 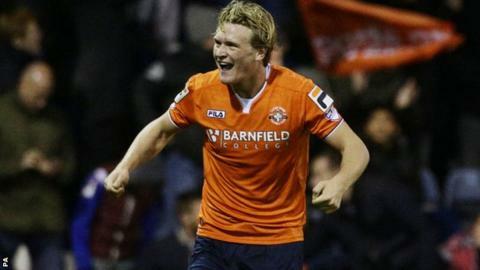 Cameron McGeehan (Luton Town) right footed shot from the centre of the box to the bottom left corner. Assisted by Josh McQuoid. Attempt missed. Josh McQuoid (Luton Town) right footed shot from the left side of the box is close, but misses to the right. Michael Gash (Barnet) wins a free kick in the attacking half. Attempt missed. Curtis Weston (Barnet) right footed shot from outside the box misses to the left. Corner, Barnet. Conceded by Alex Lawless. Attempt missed. Jonathan Smith (Luton Town) left footed shot from the centre of the box is too high. Curtis Weston (Barnet) wins a free kick on the right wing.